Improving discipline will be key to Ulster affecting a different outcome in Europe from their recent Guinness PRO14 loss to Scarlets when the sides meeting on Friday night. Ulster meet the Welsh side at Parc Y Scarlets before facing them again a week later in the back-to-back pool matches in the Champions Cup. The Celtic cousins will have met four times in two months - it is one apiece after the PRO14 meetings. Two weeks ago Ulster suffered a 29-7 loss with a well below average performance at the Llanelli venue. Ill discipline and poor ball retention were the key factors behind that loss and McFarland highlighted those as he looks ahead to visiting the team still seeking a first win in Pool Four in Europe. Reflecting on that last meeting the Ulster boss added: “We gave them access into our ‘22’ 15 times, nine tines through penalties and although we defended pretty well at times, you cannot give access to a team that understands what they are doing like them, you’re not going to win the game. The record away to Scarlets is not good for the Irish province, but McFarland highlighted that Parc Y Scarlets is not a place many visiting teams get much change out of. He said: “It is not an easy place full stop, I think. “Out of 30-odd games at home over the last while, they have lost at home one, maybe two, drawn two games and lost to Racing 92. Ulster and Scarlets are locked on points in second place in Conference B of the PRO14, but the Irish Province have a three point edge in Pool Four in Europe, sitting in third place after a win and a loss. Scarlets have lost both their opening pool games, picking up a losing bonus point in the home loss to group leaders Racing. 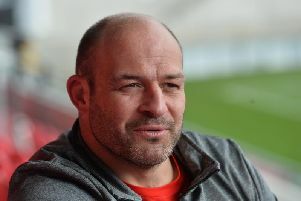 McFarland insisted that the Scarlets were “absolutely note” out of the reckoning in Europe. “And whether they were or not, and they are clearly not, this is a team, that doesn’t lose at home. “They have a very proud record which they will be battling for. When the sides meet two weeks ago, both were without several of their international stars who were finishing off their respective November Test series’ with Ireland or Wales. “There may be different individuals involved this time but their style of play will stay similar,” said McFarland. “Tactically they will change bits and pieces to their game but in terms of strategy, where they play and their philosophy, that’s not going to change too much. “We expect nuances to their play but we will have our own changes too,” he added. Recognising the importance of the game in Europe McFarland said: It’s the biggest game of the Champions Cup so far and the Champions Cup is a massive competition. “I suppose from that way of looking at it, it probably is. It’s a cliché but we take every game as it comes.